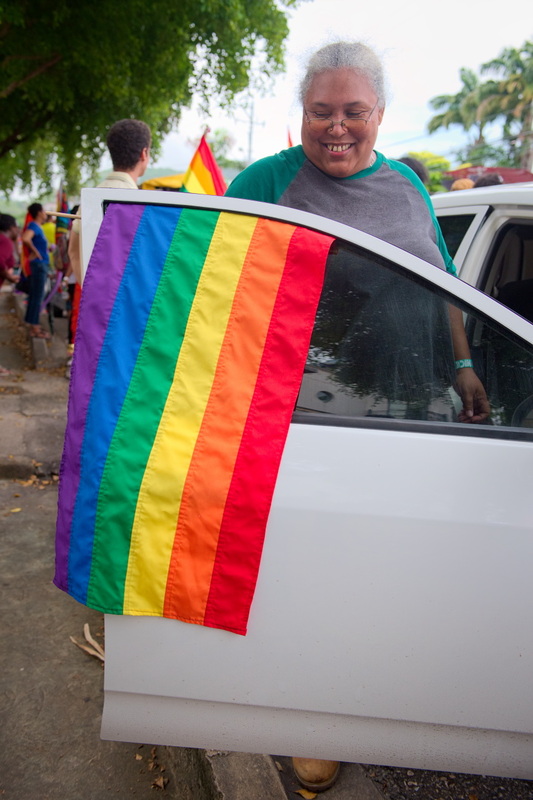 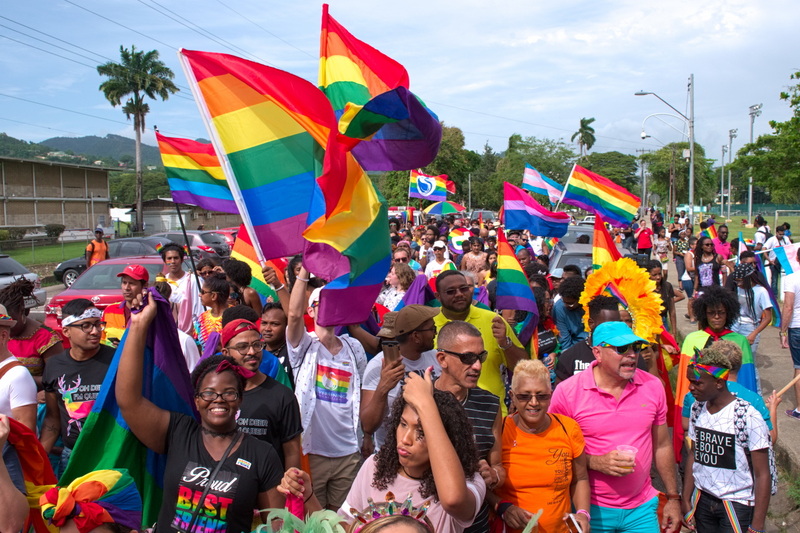 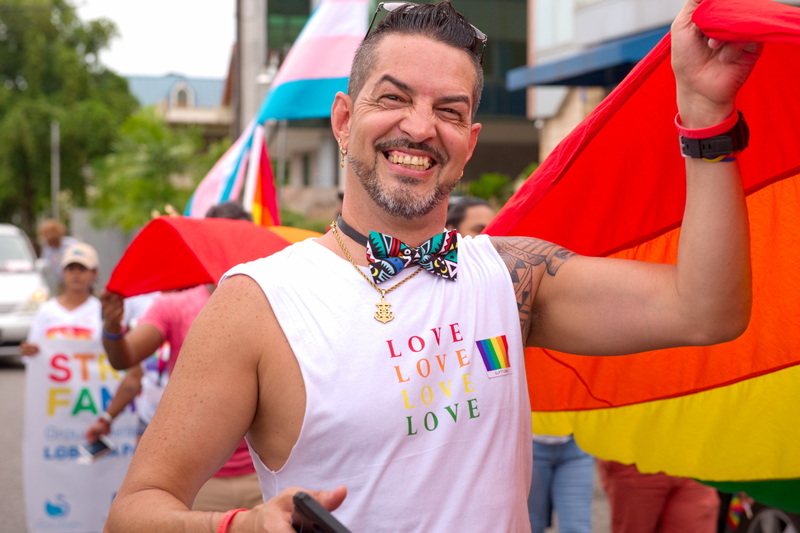 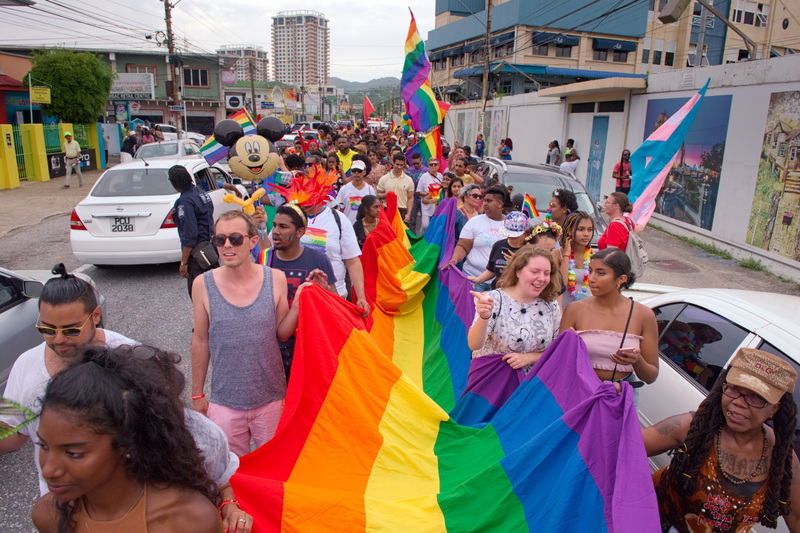 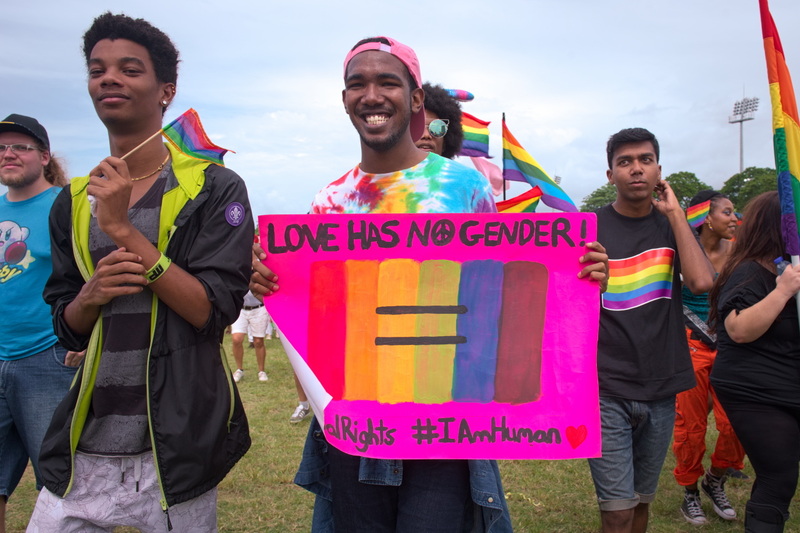 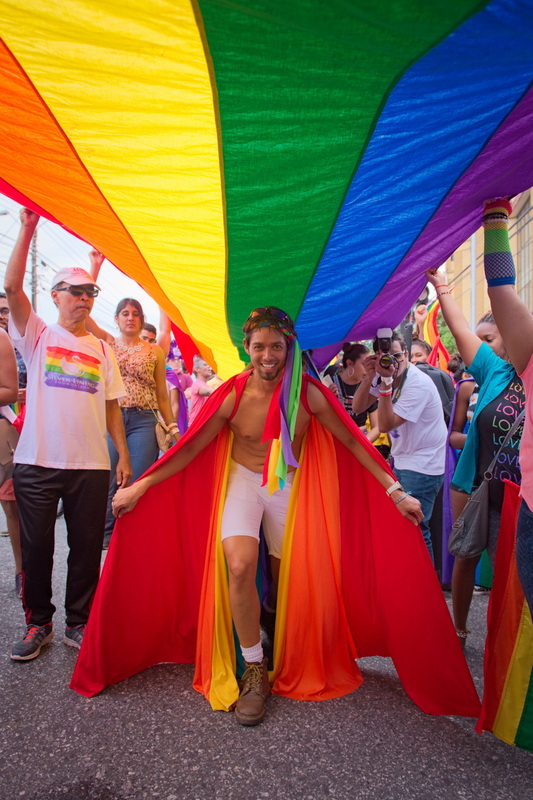 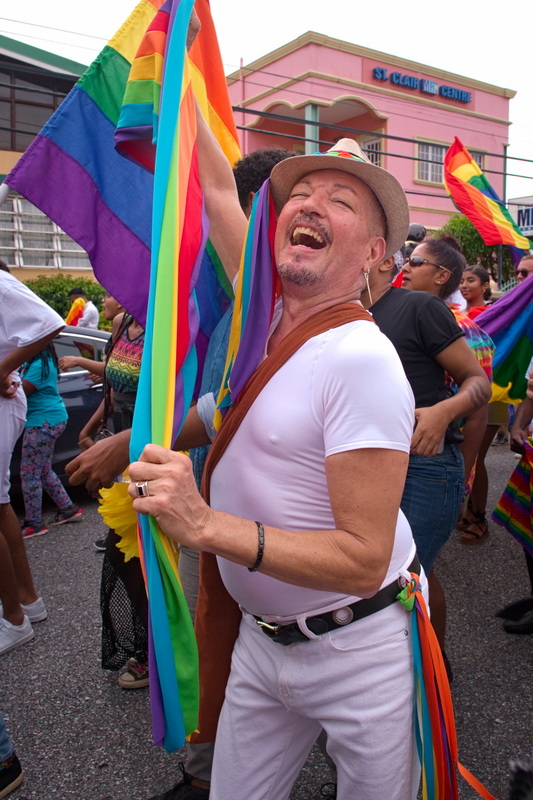 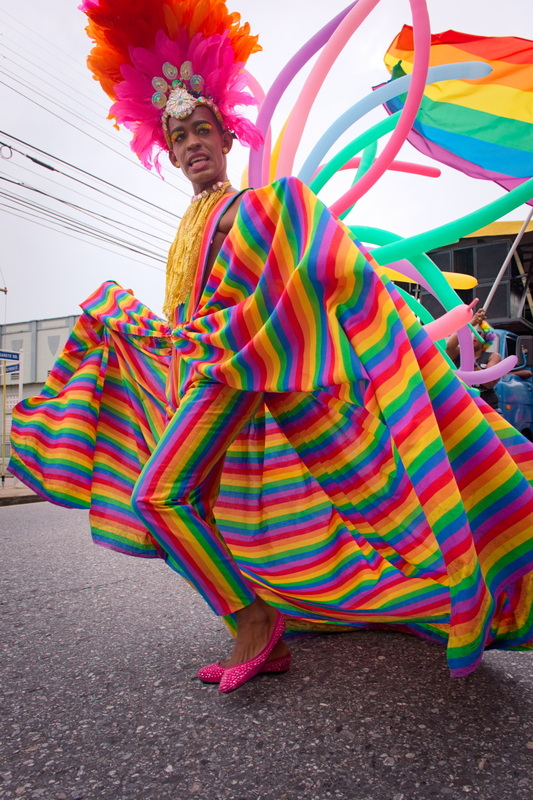 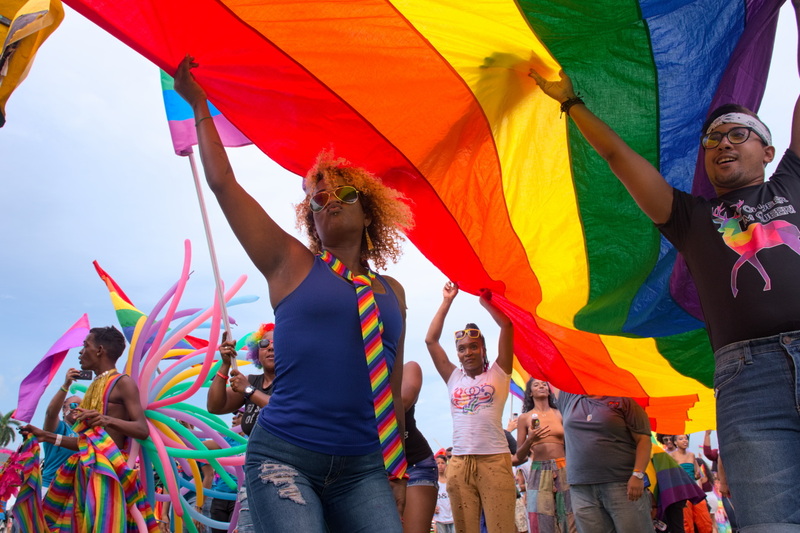 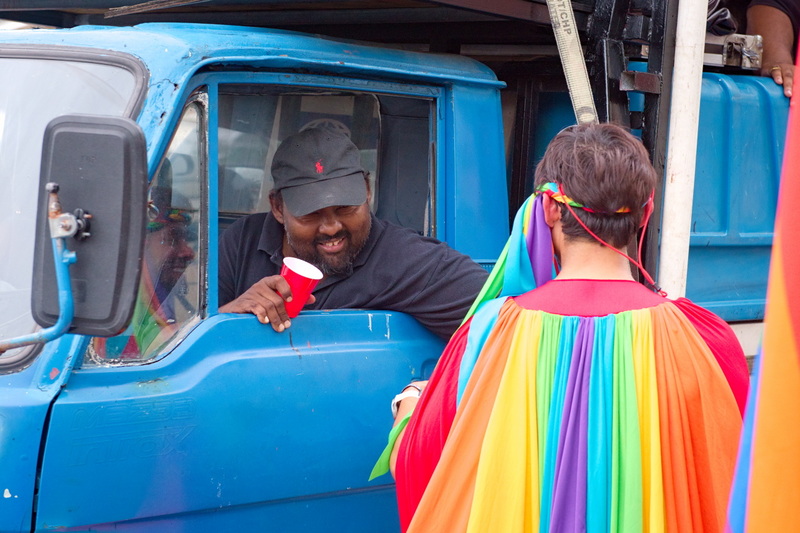 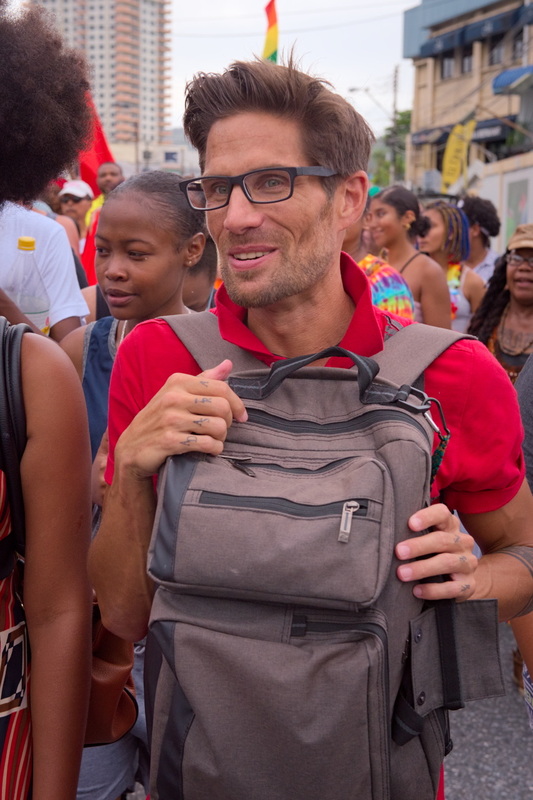 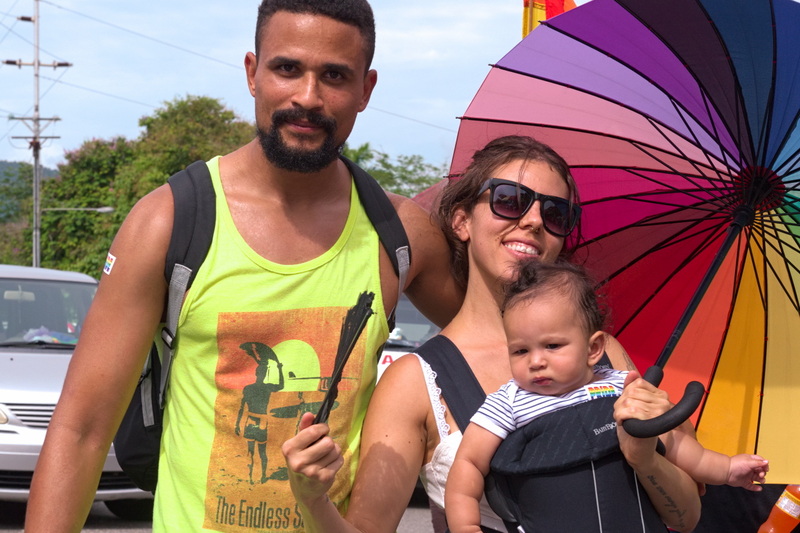 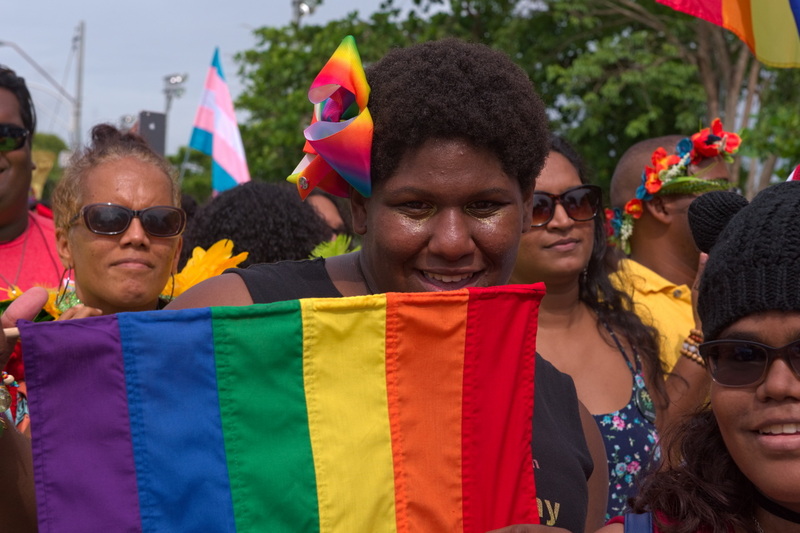 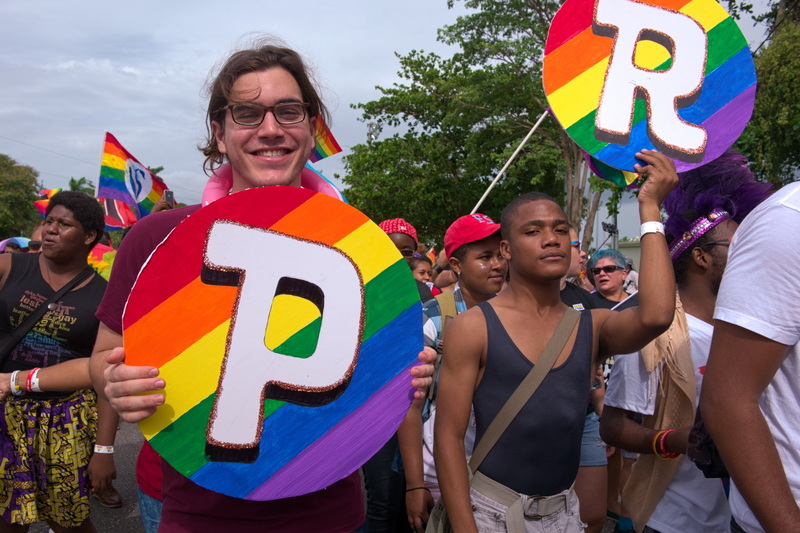 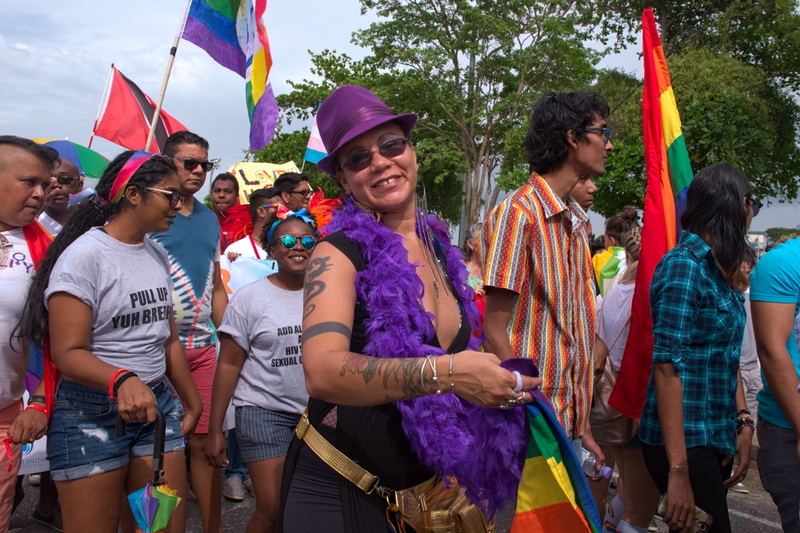 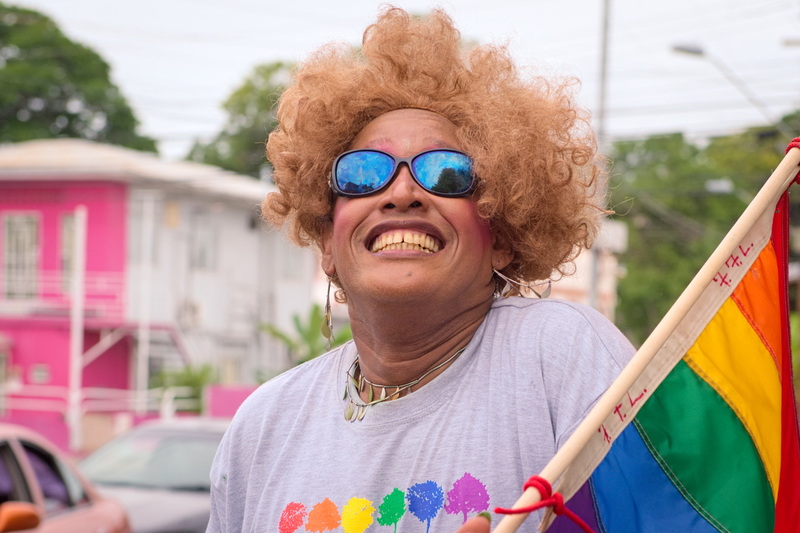 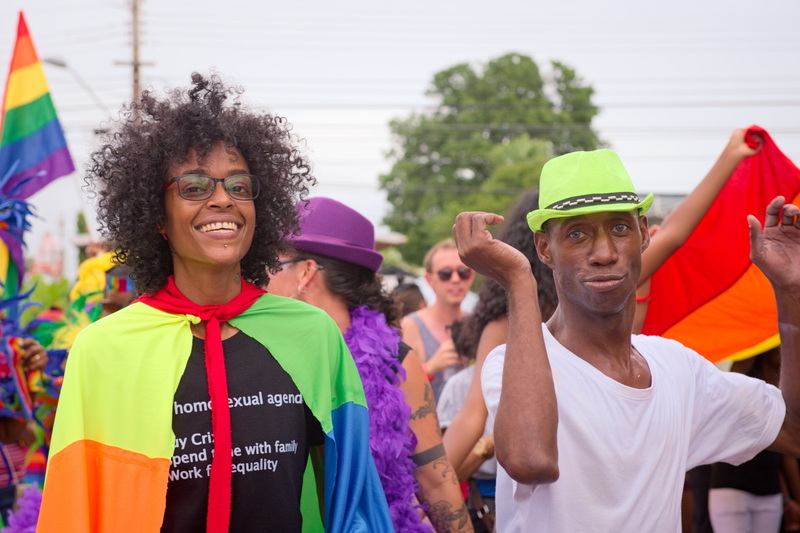 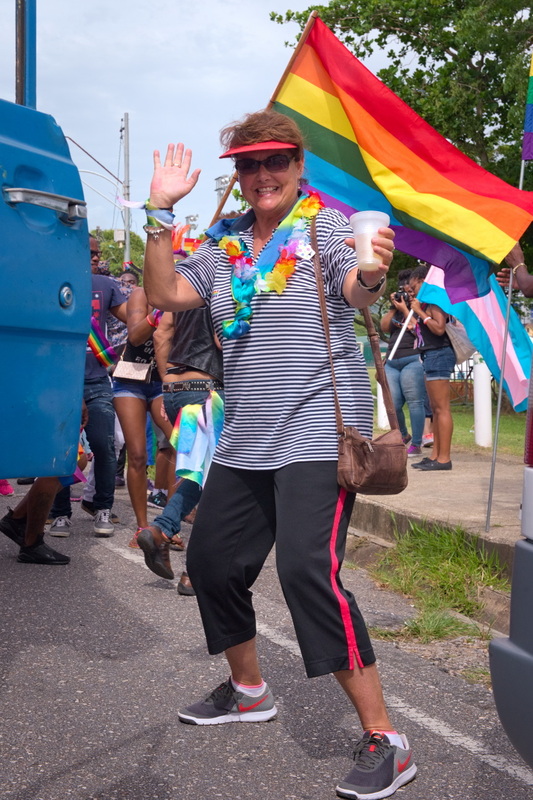 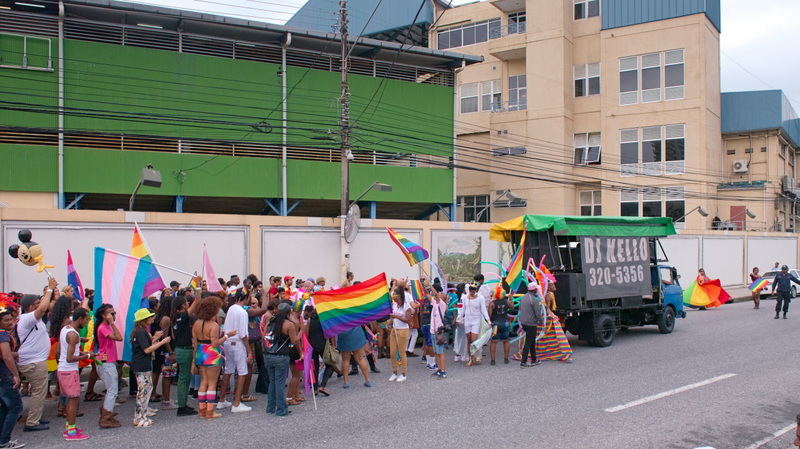 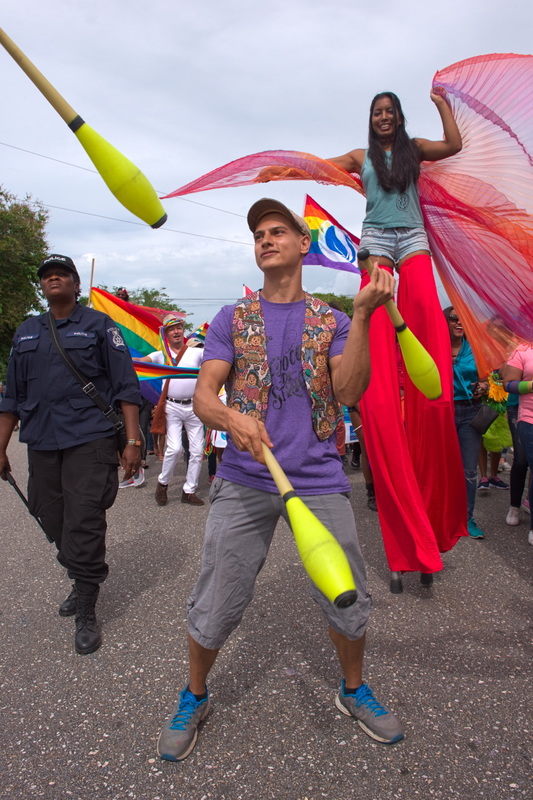 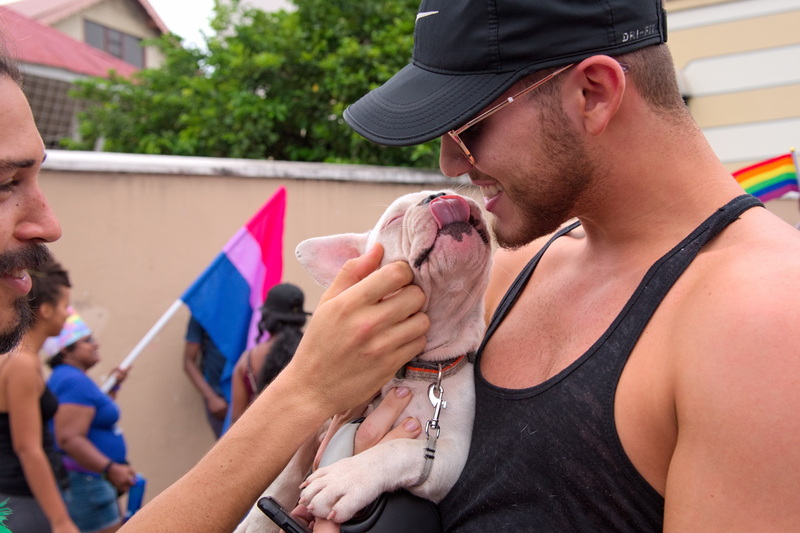 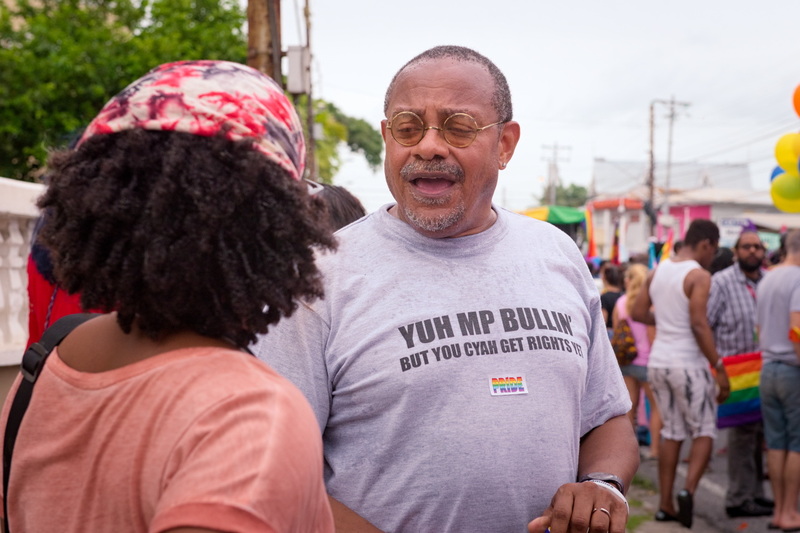 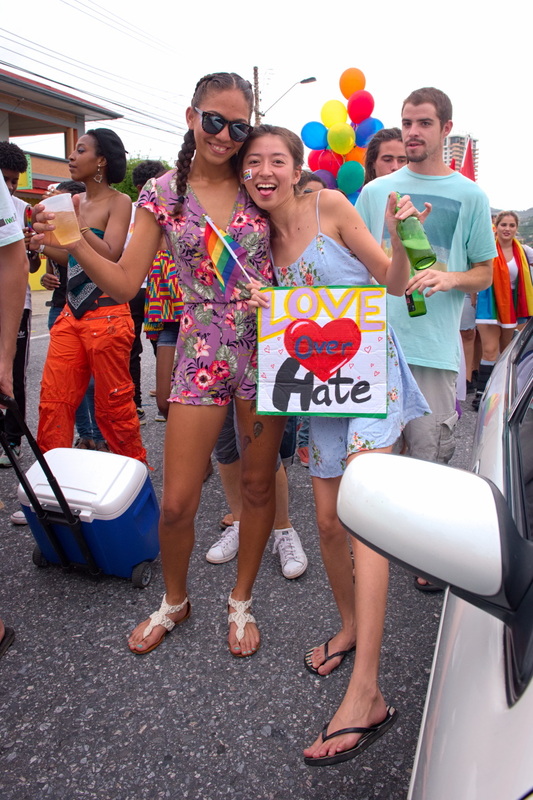 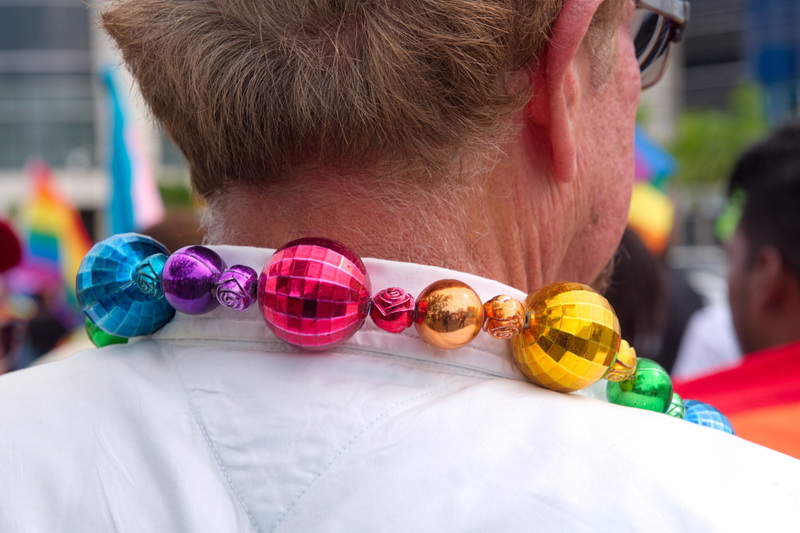 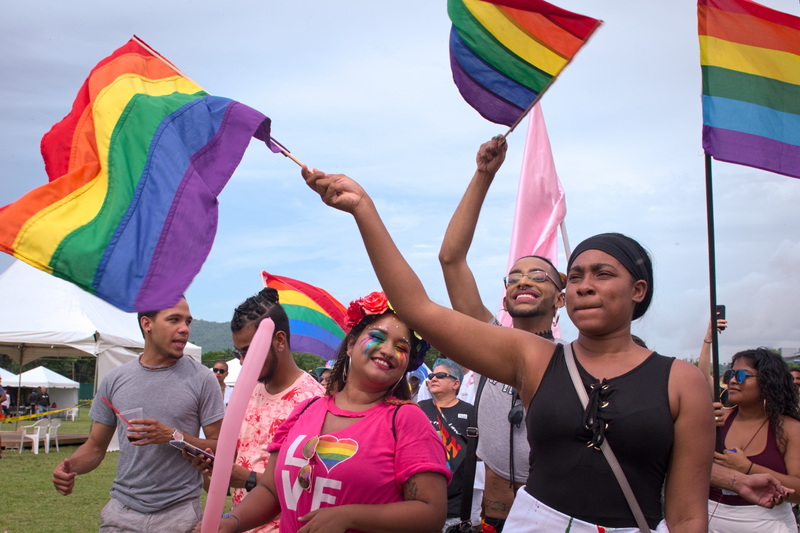 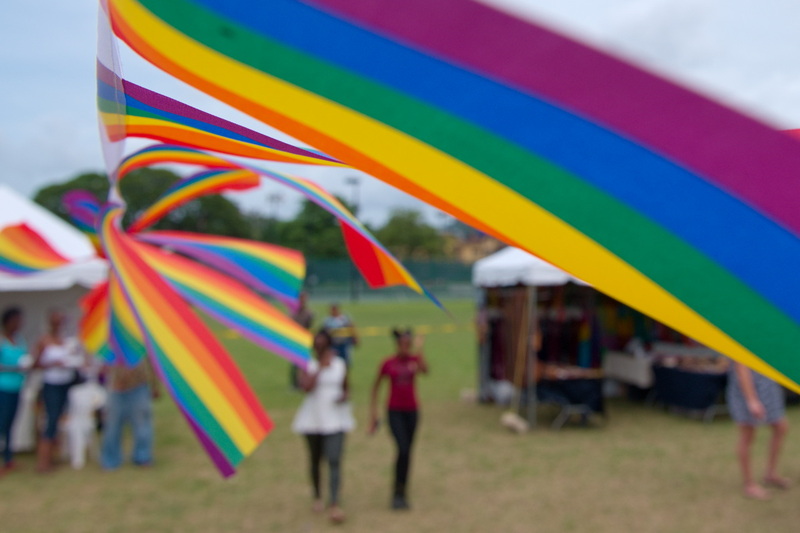 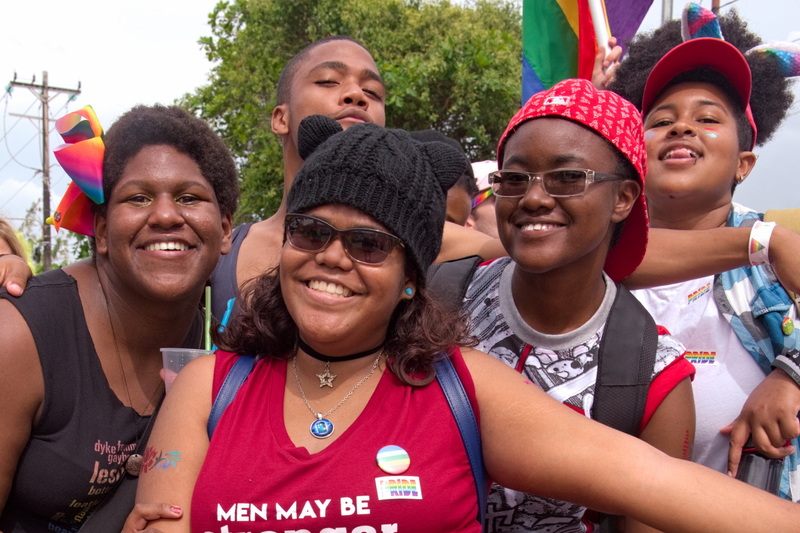 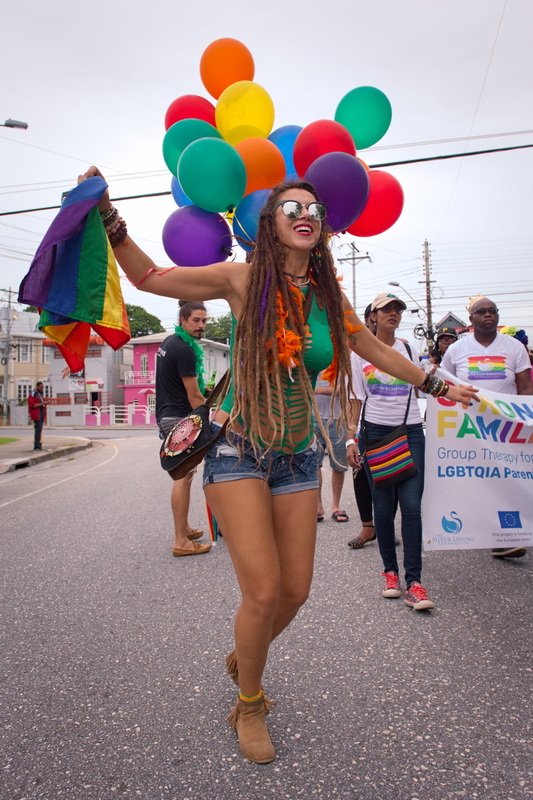 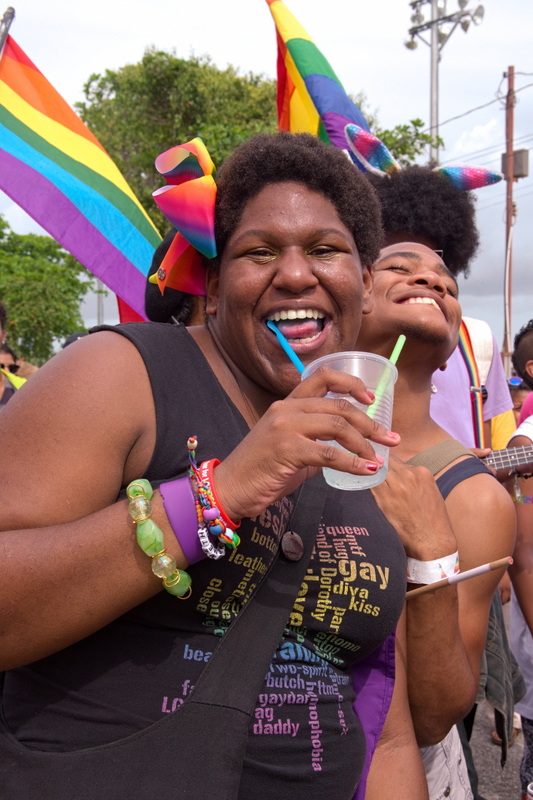 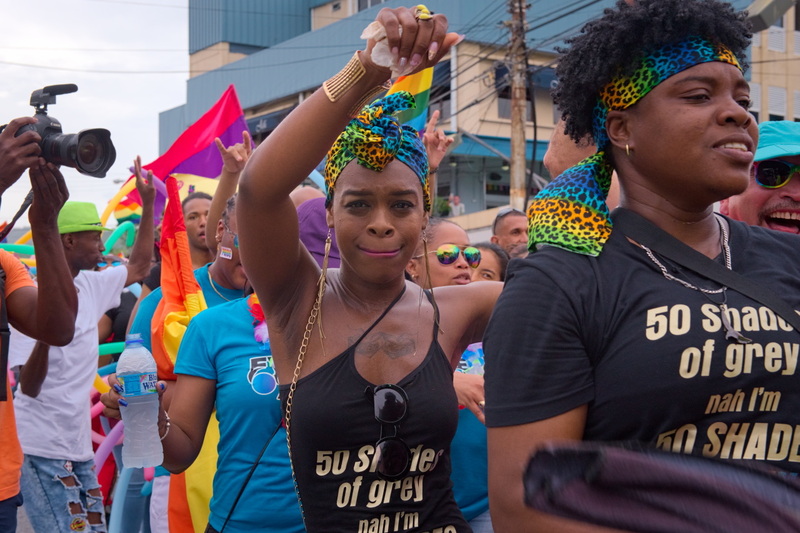 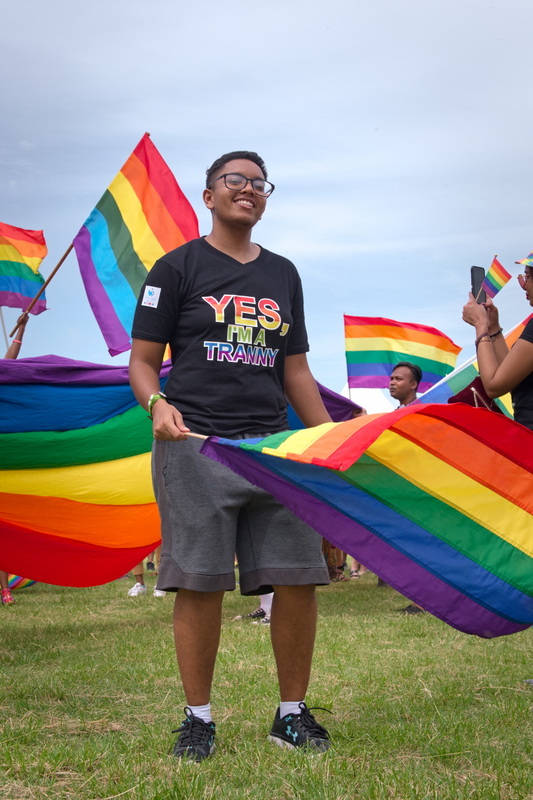 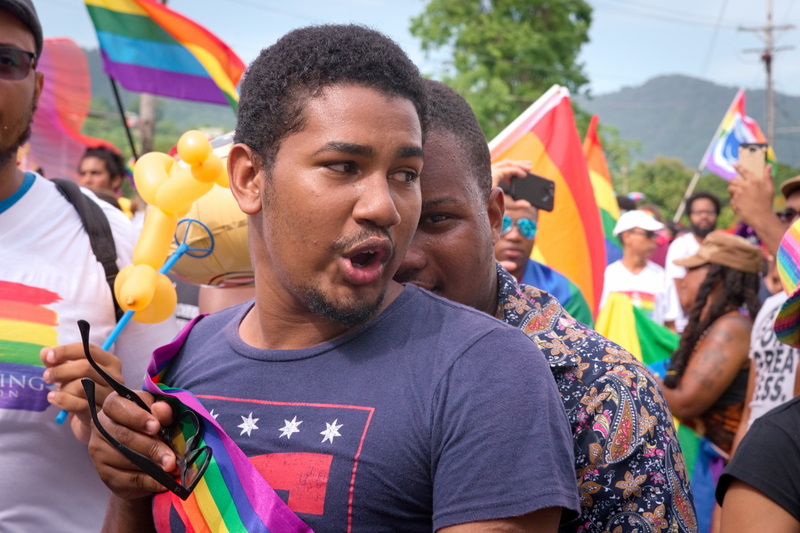 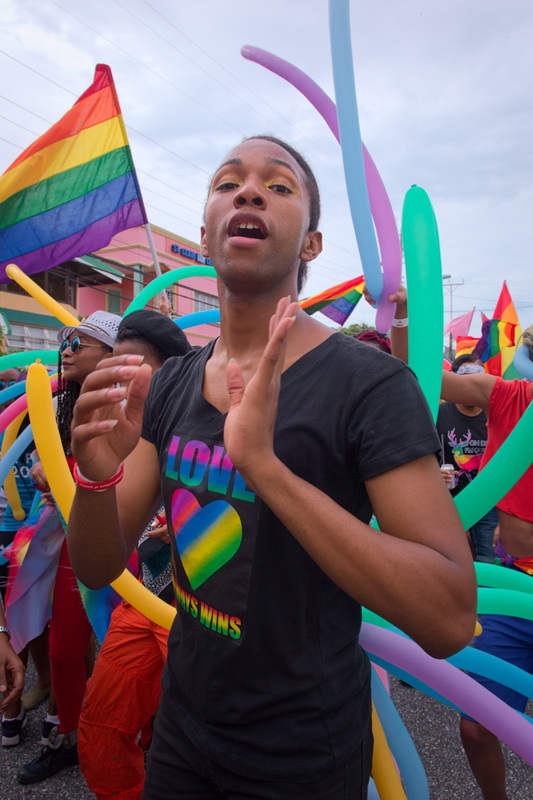 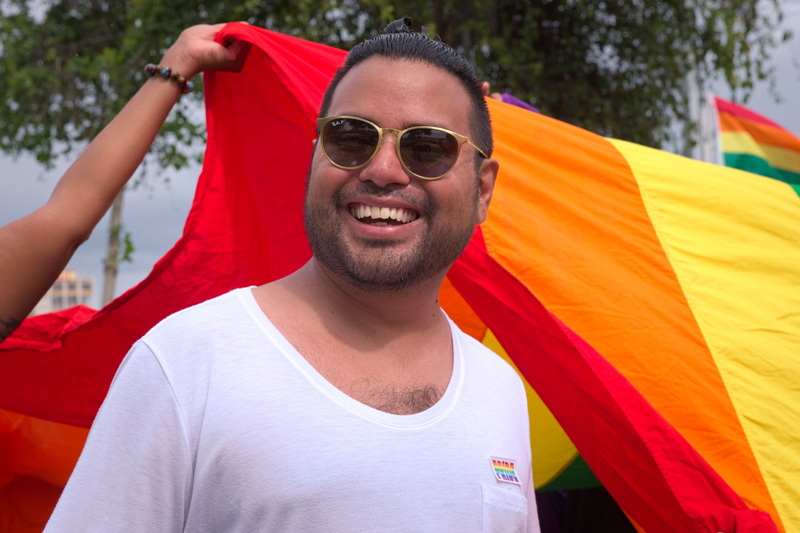 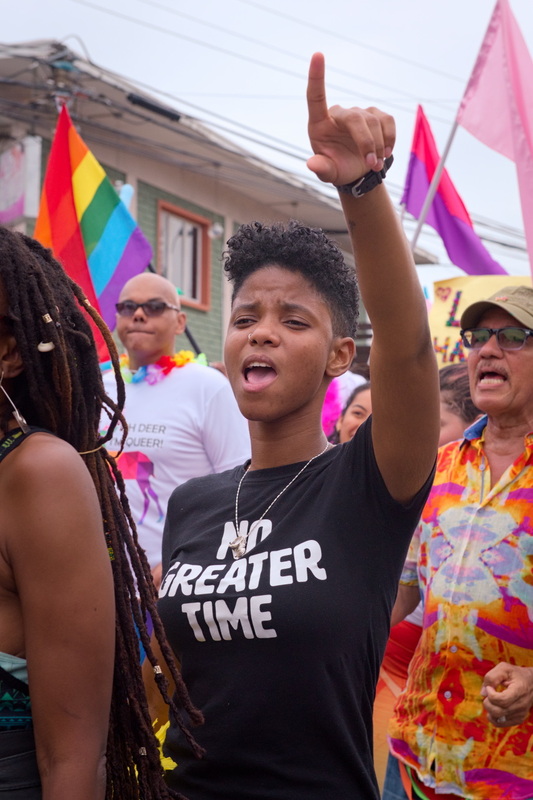 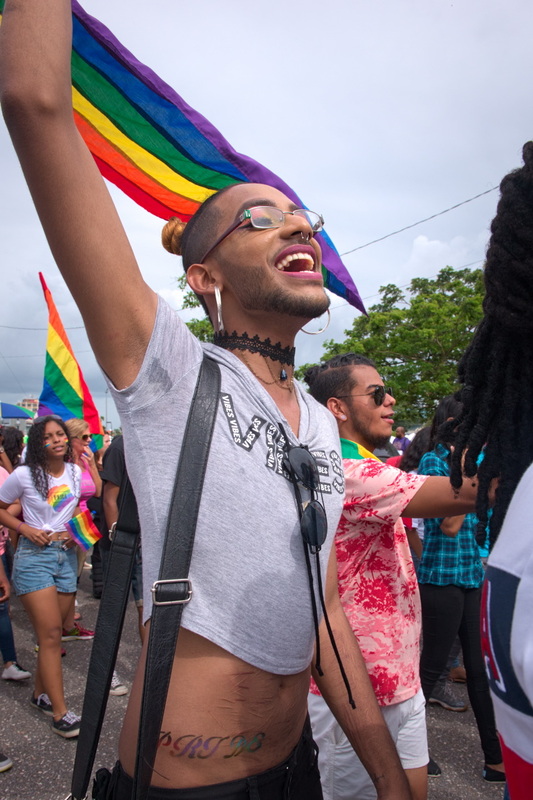 Three months after a swelling of attention on the concerns of many Trinbagonian LGBT+ persons—centred around what would prove to be a successful challenge of the TT Sexual Offences Act 1986 by Jason Jones—Trinidad and Tobago’s first ‘Pride Fair and Parade‘ is held, arranged by the TT Pride Arts Festival Committee. 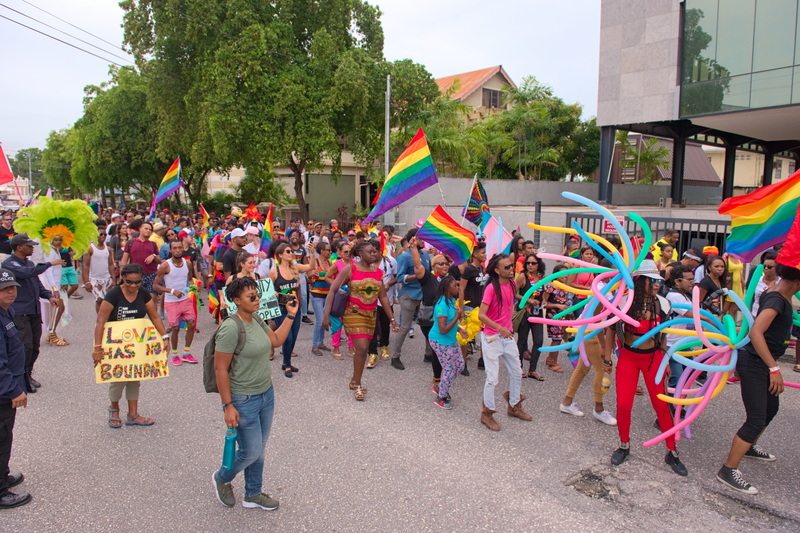 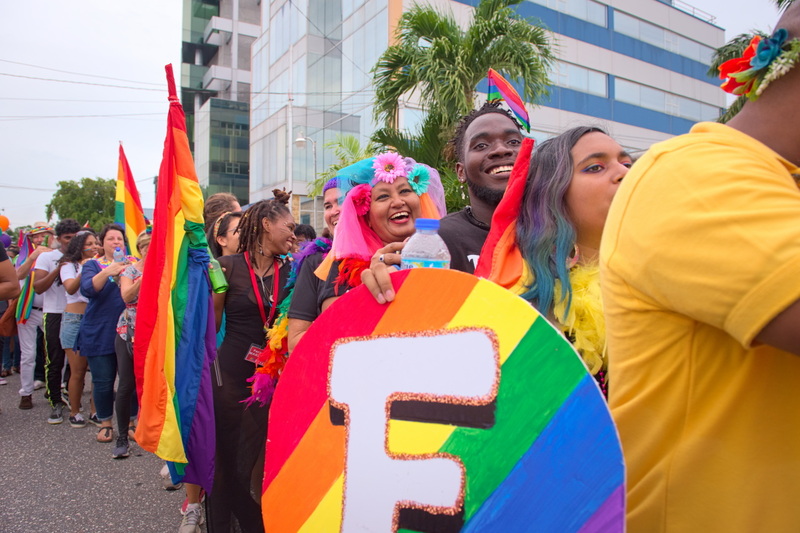 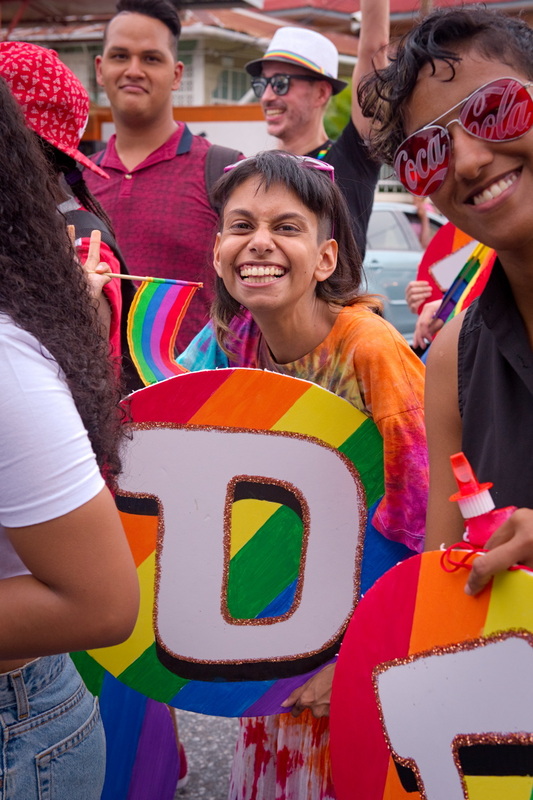 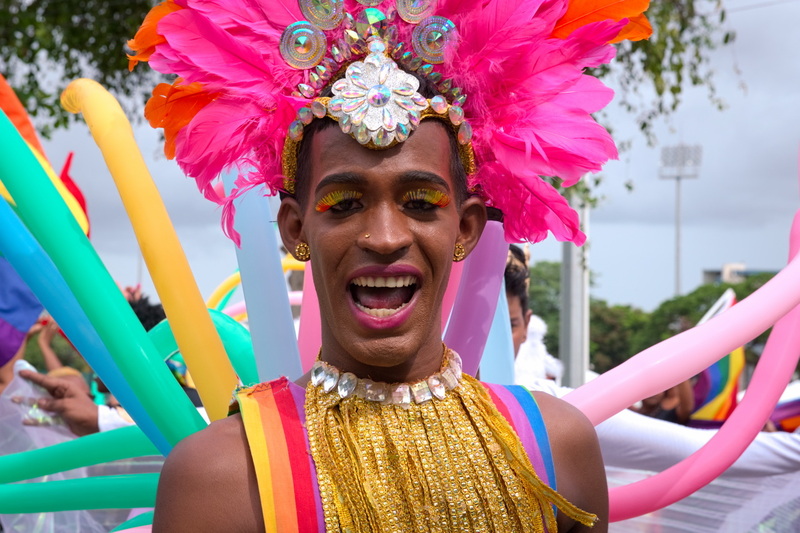 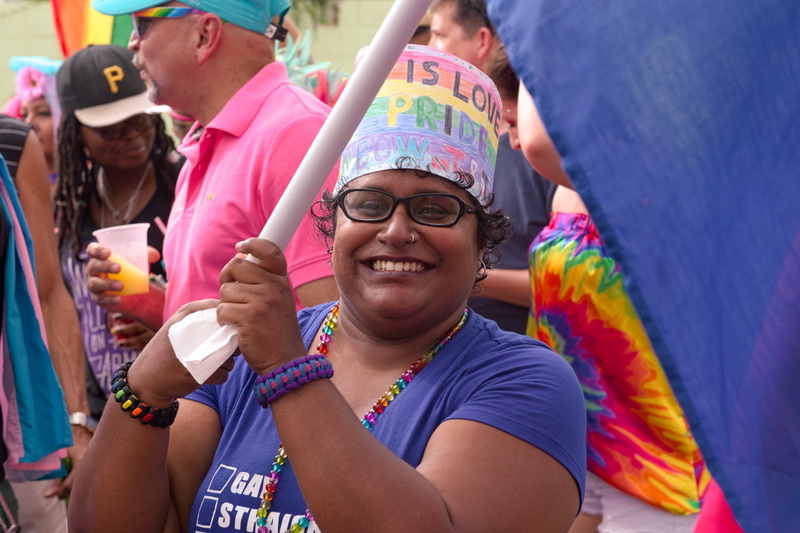 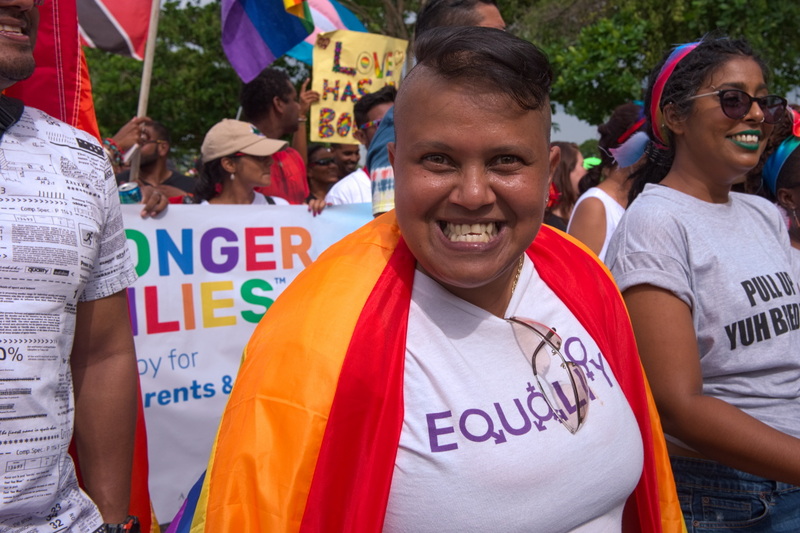 Trinbago's first 'Pride Fair and Parade' on 28th July, 2018. 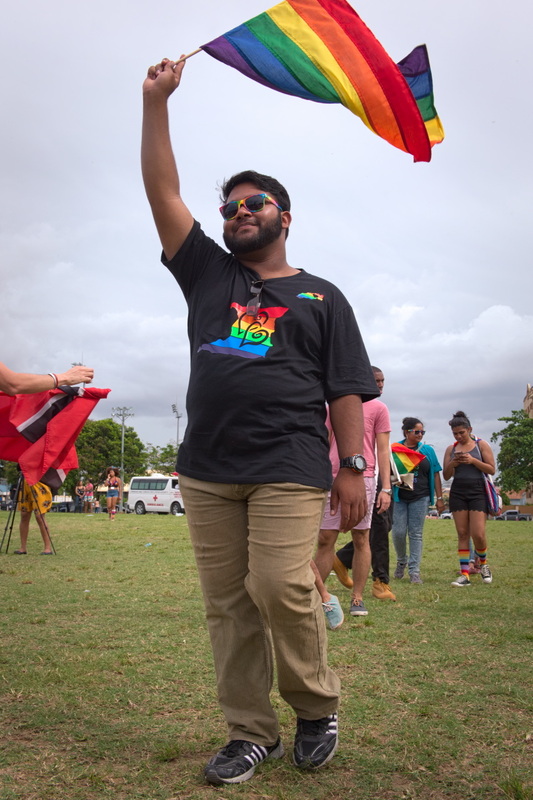 It is a partly cloudy, bright but cool afternoon, on 28th July 2018 at Nelson Mandela Park (previously called ‘King George V Park’). 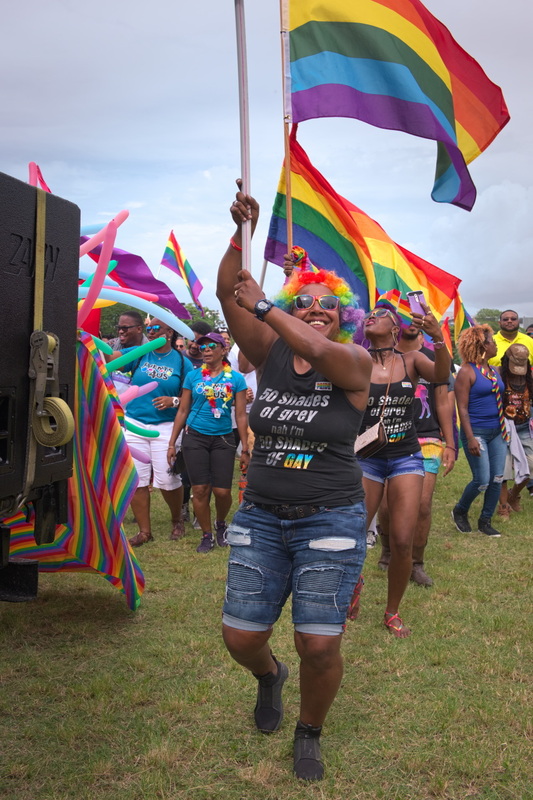 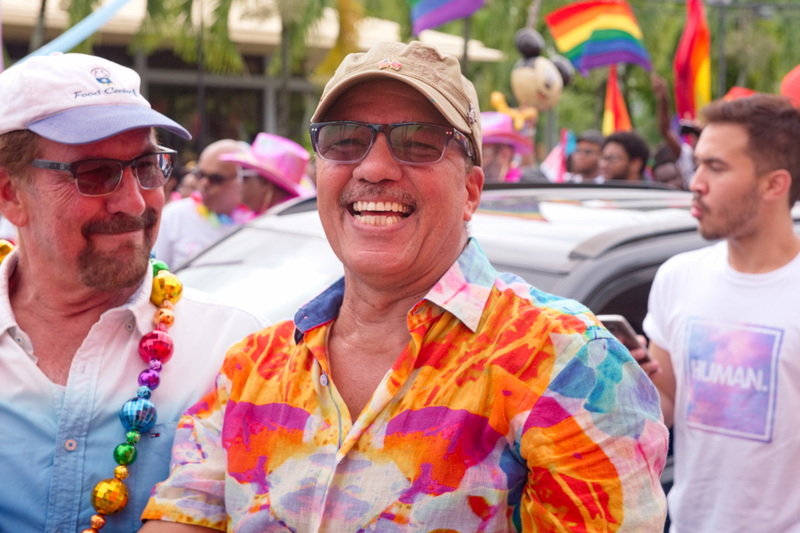 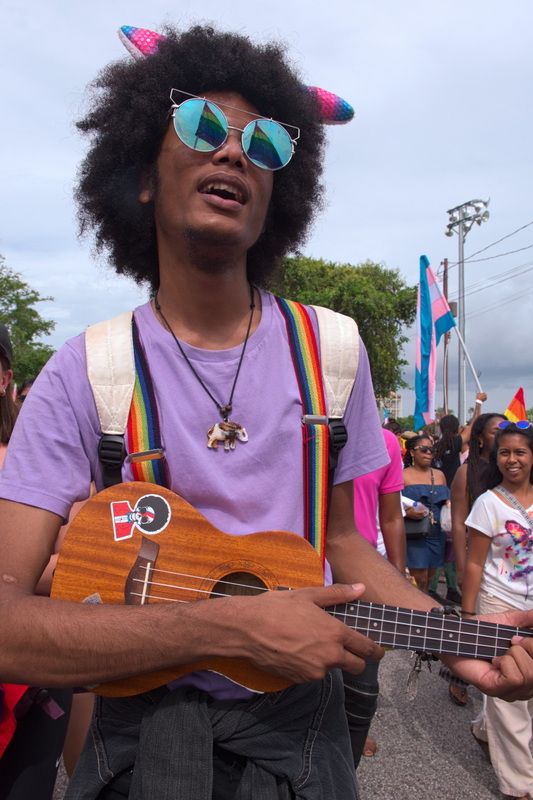 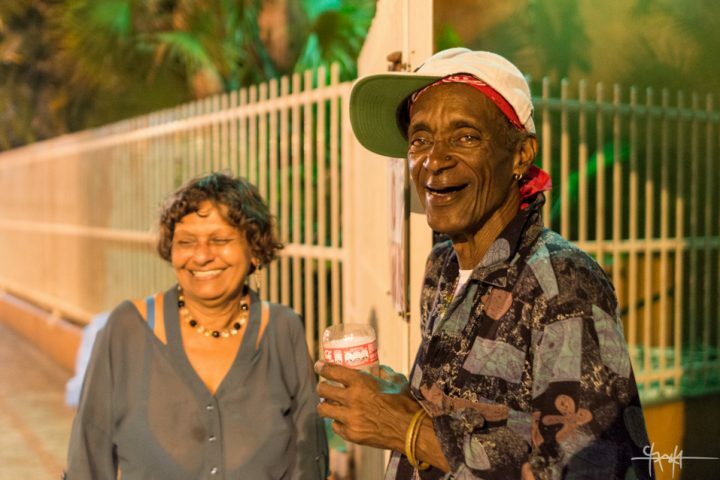 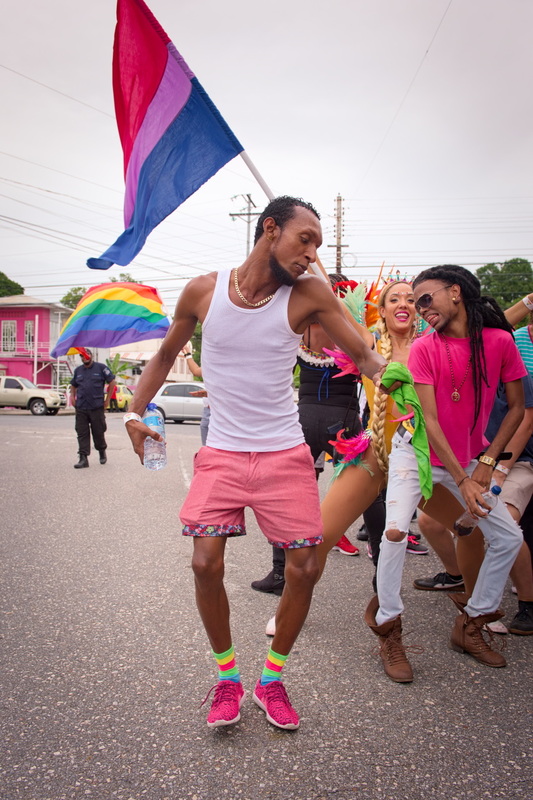 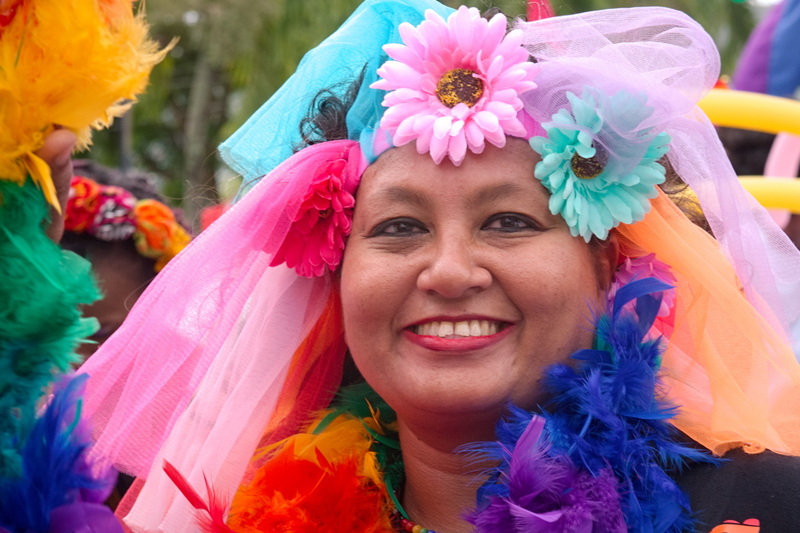 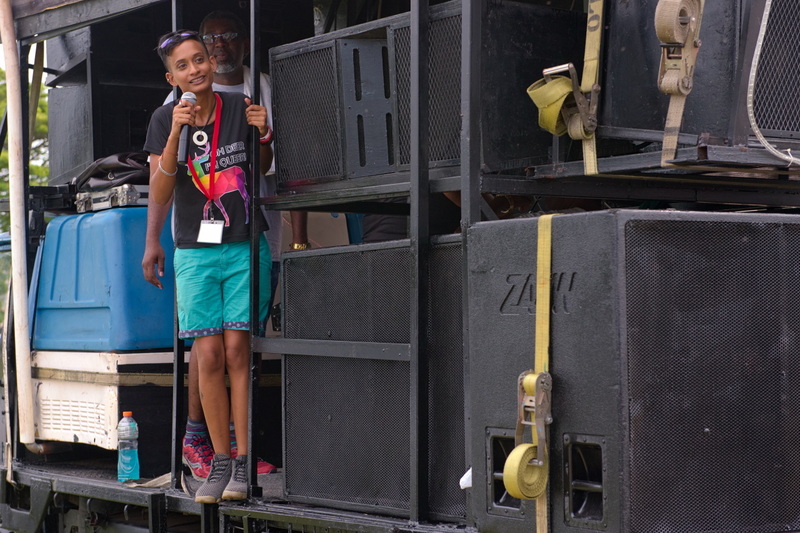 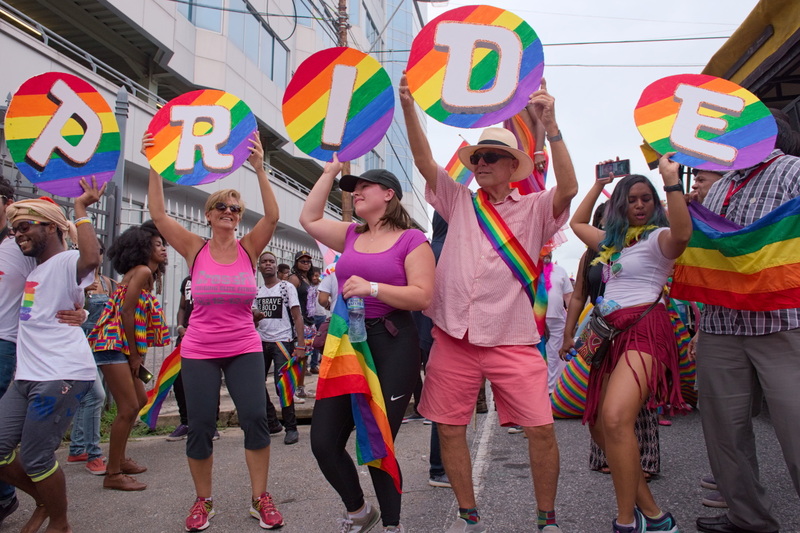 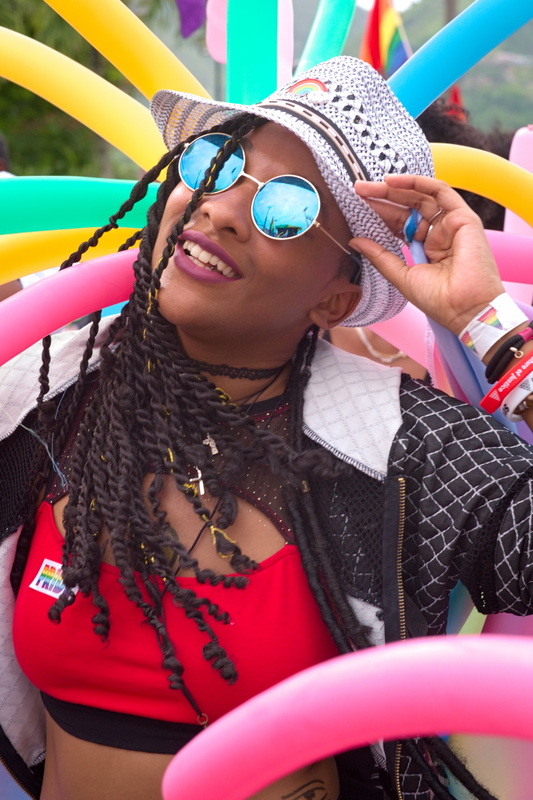 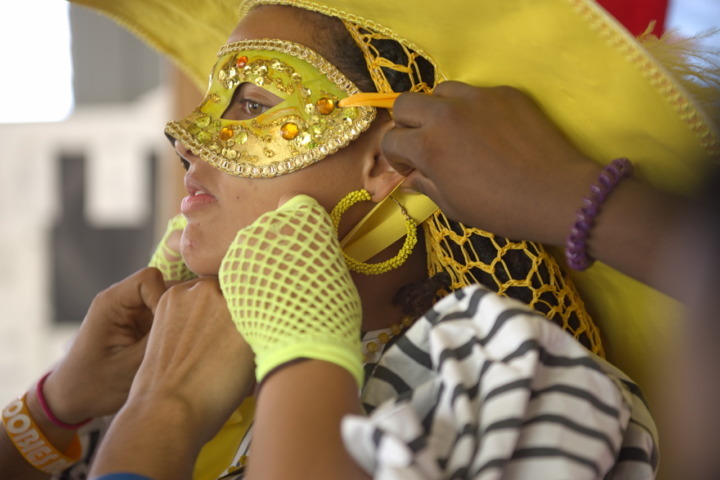 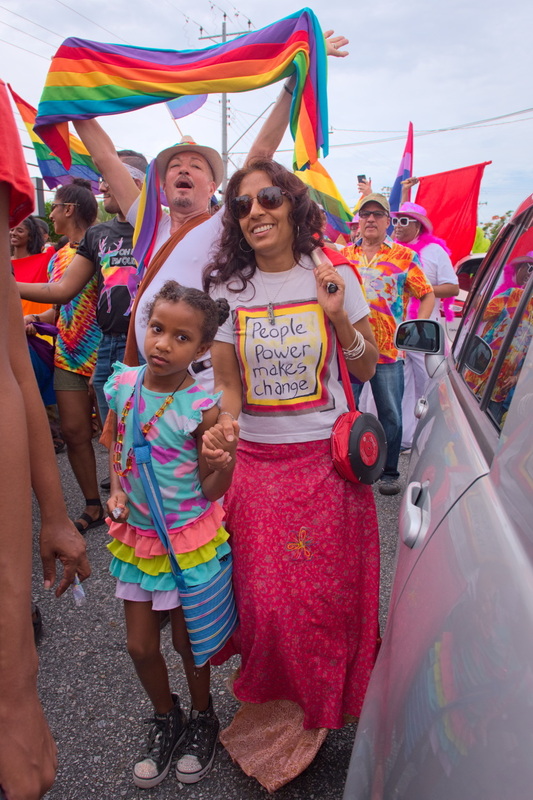 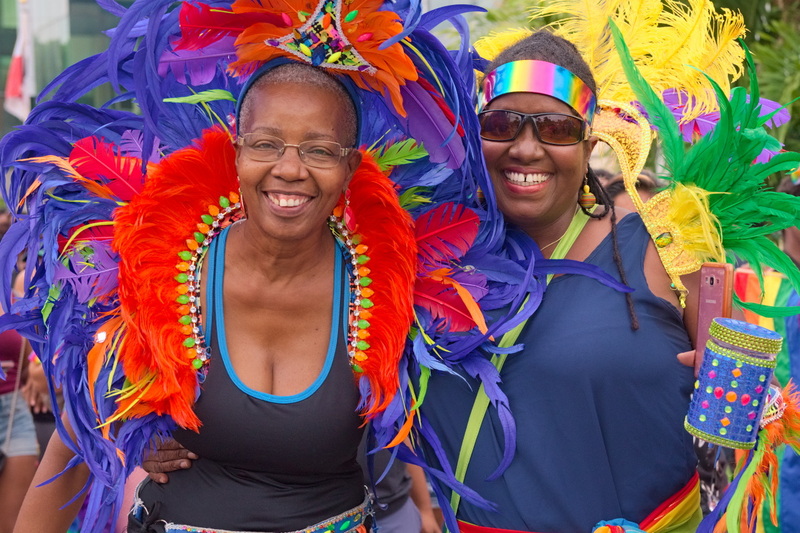 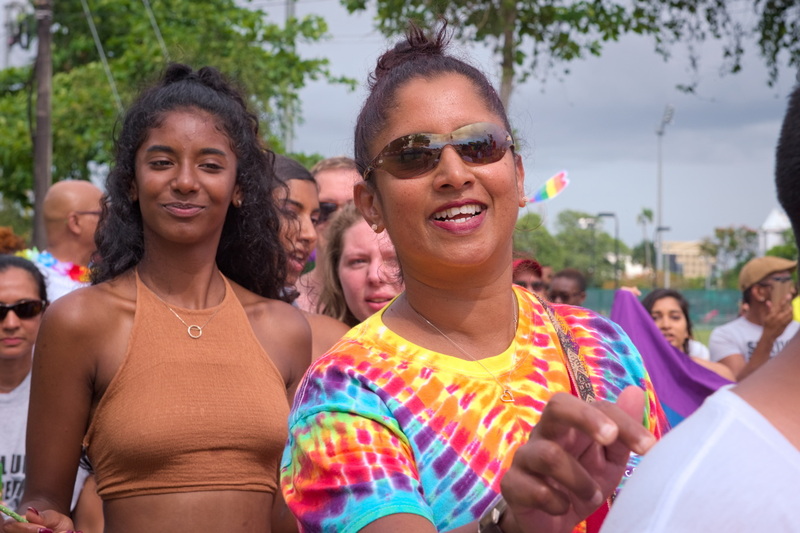 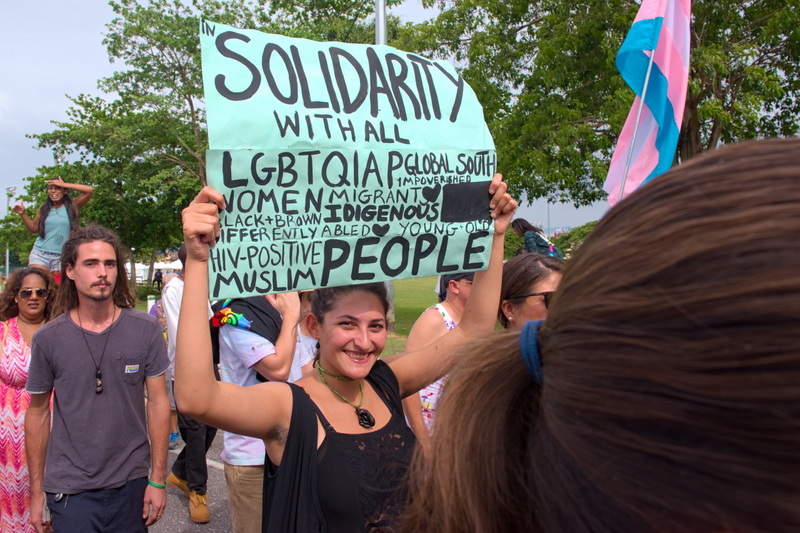 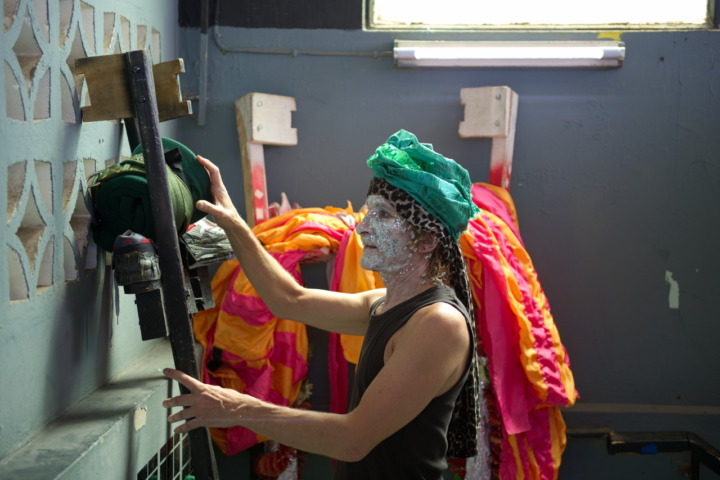 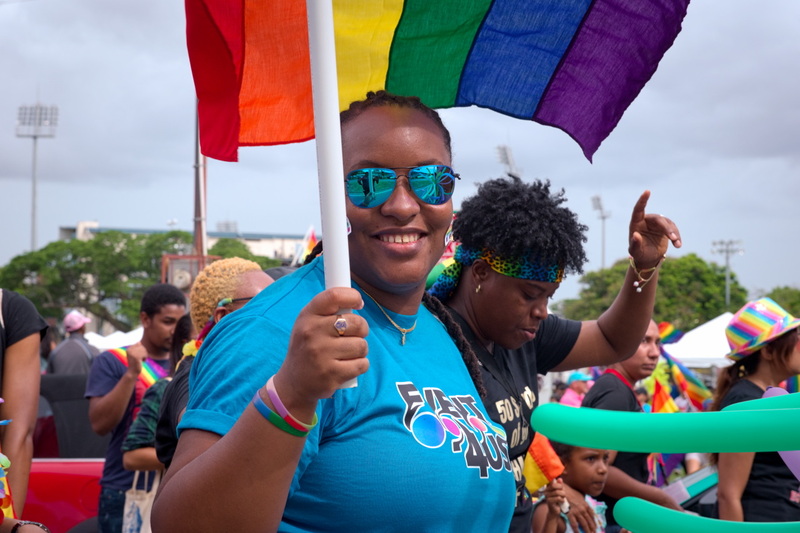 Gathered within a circle of tents, paraders bedecked in various colourful outfits eat, drink, and celebrate to soca music, awaiting the organisers’ signal to take to the streets. 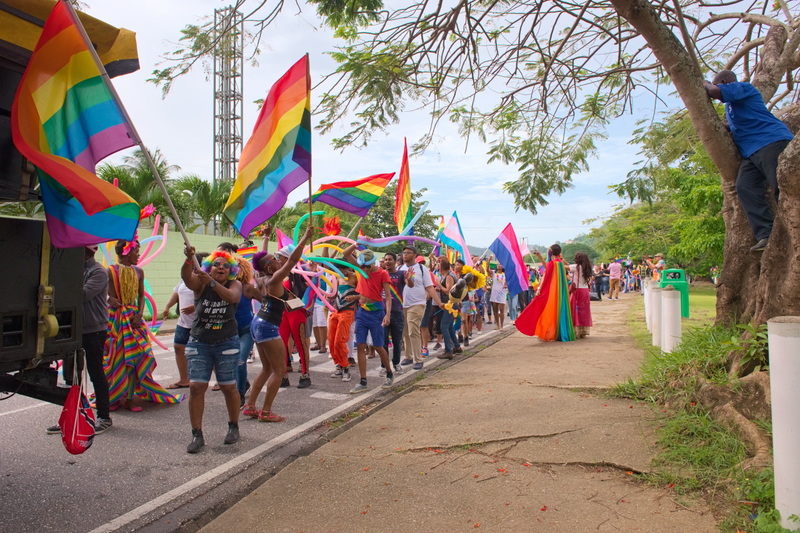 Horizontally-striped rainbow flags are visible in every direction, intermittent with a couple transgender flags and a few red, white, and black TT national flags. 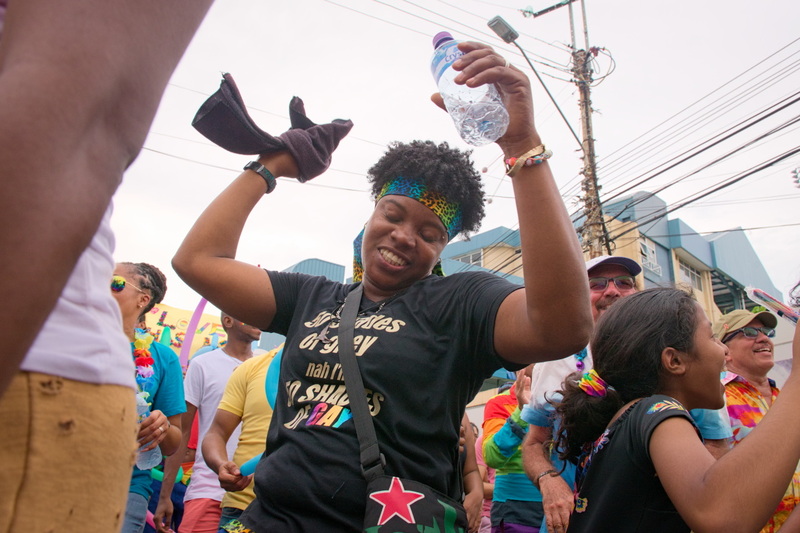 Dancing ensues, while clear instructions are given that this is to be fun and celebratory event, and that engaging in confrontations during the parade will not be condoned. 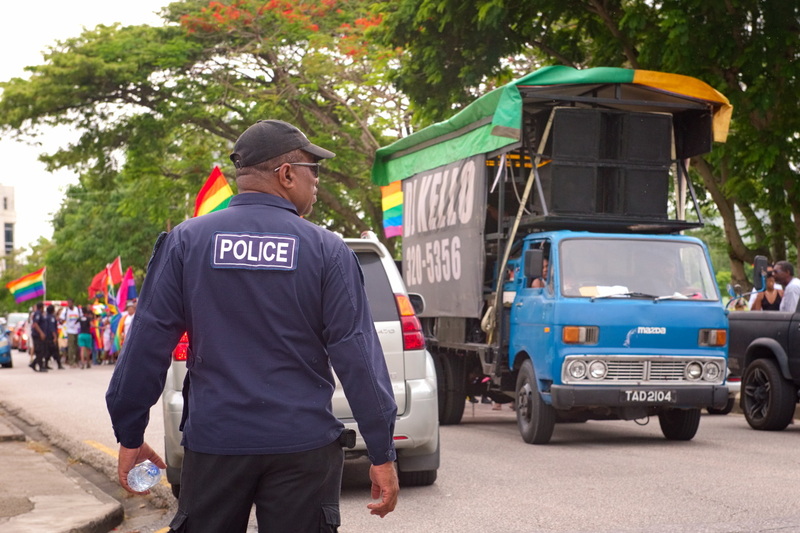 A contingent of TT police are on hand to help ensure safety and to direct the flow of traffic. 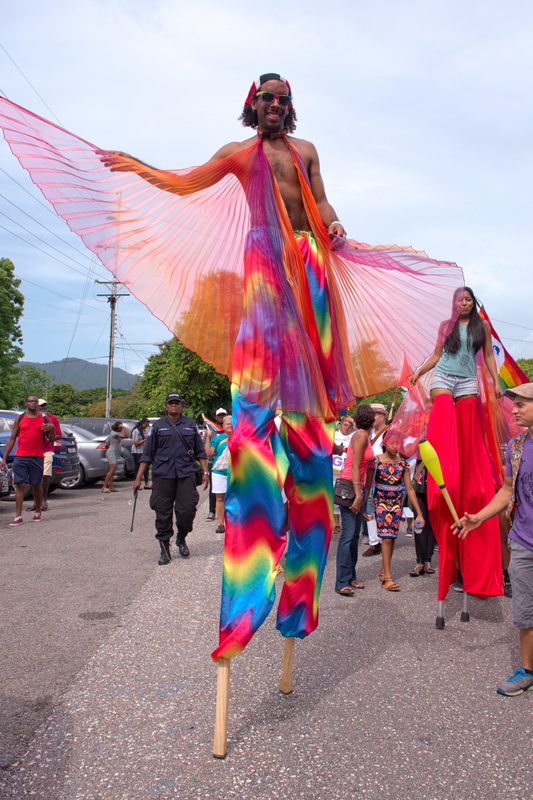 Eventually, at close to 15:00, the parade takes off. 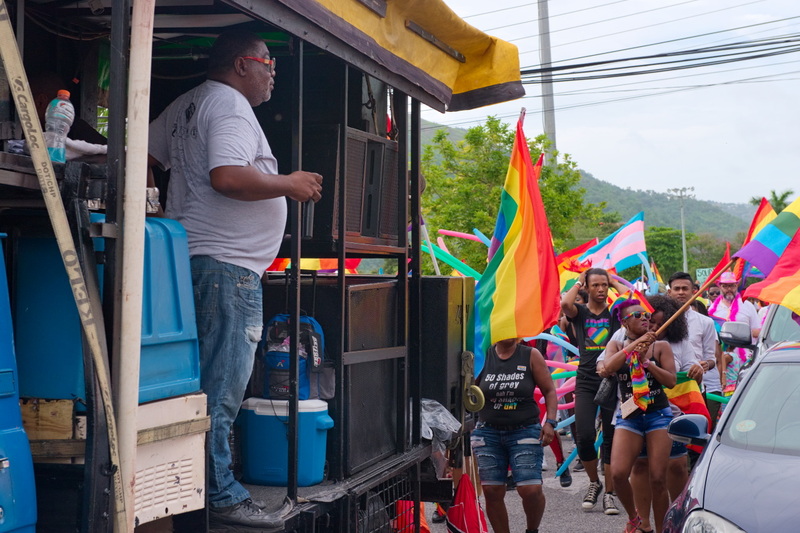 With a music truck at the head, then vibrant revellers (some of whom in prettymas elements), then a shuttle, and an ambulance at the caravan’s tail, the parade cannot help but take on a feeling of a being miniature TT Carnival band. 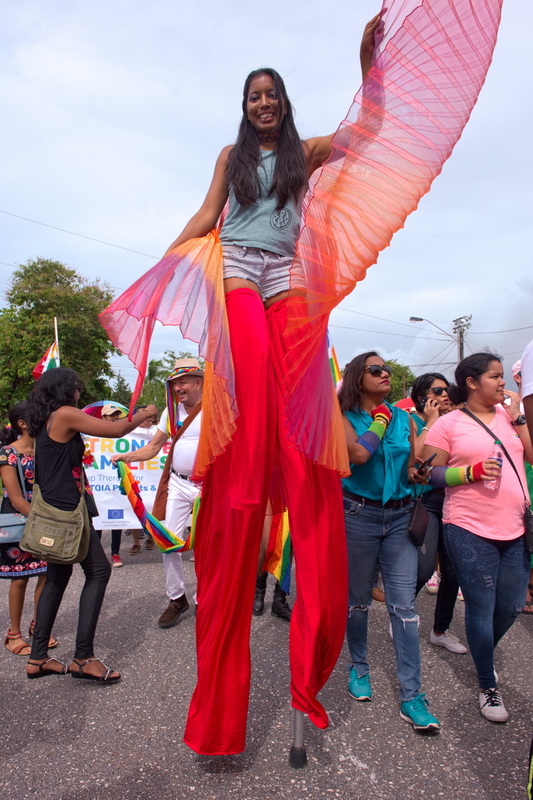 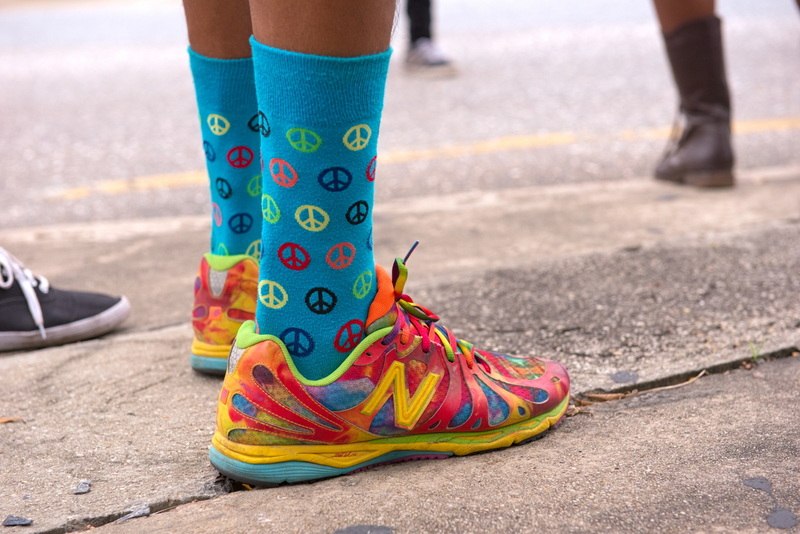 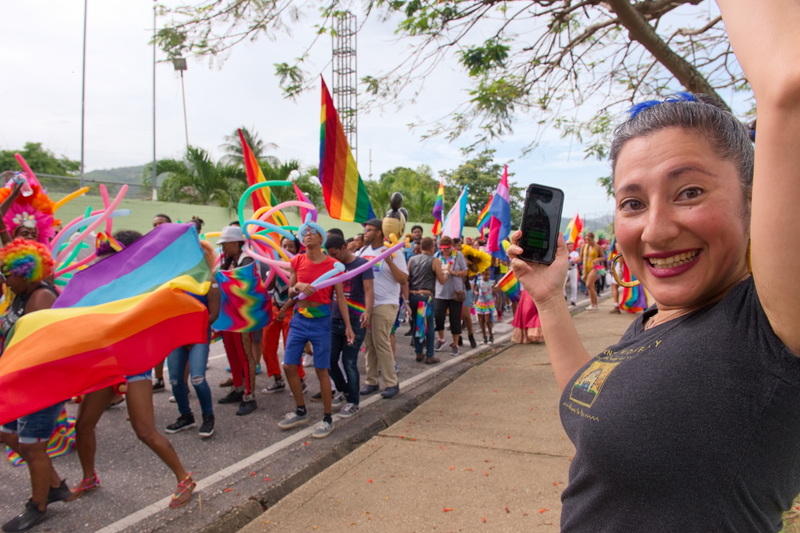 Many varied races, ages, sexes, genders, and sexual-orientations dance and sing together as triumphant Caribbean music plays and the parade slowly winds around Nelson Mandela, turning onto Tragarete Road. 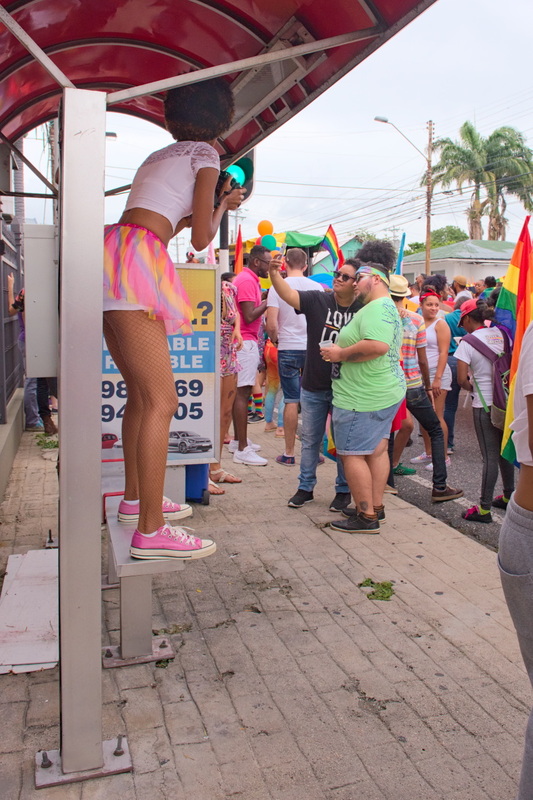 Curious onlookers appear, many stopping whatever their previous objectives to intently watch and record on mobile phones. 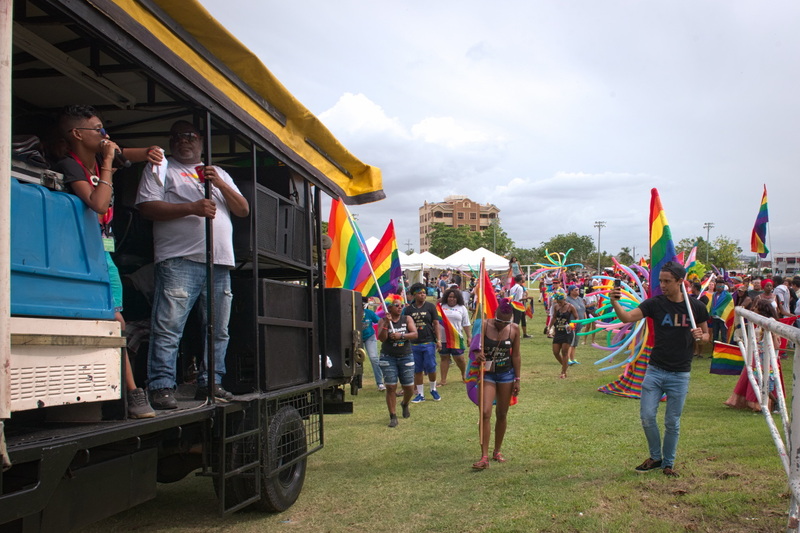 By 15:30, the convoy moves past the Queen’s Park Oval toward Gray Street, stopping for awhile to allow its deputation to fully enjoy dance sessions to ‘YMCA’ by the Village People and a spontaneous syncronised execution of what might be the ‘Electric Slide’. 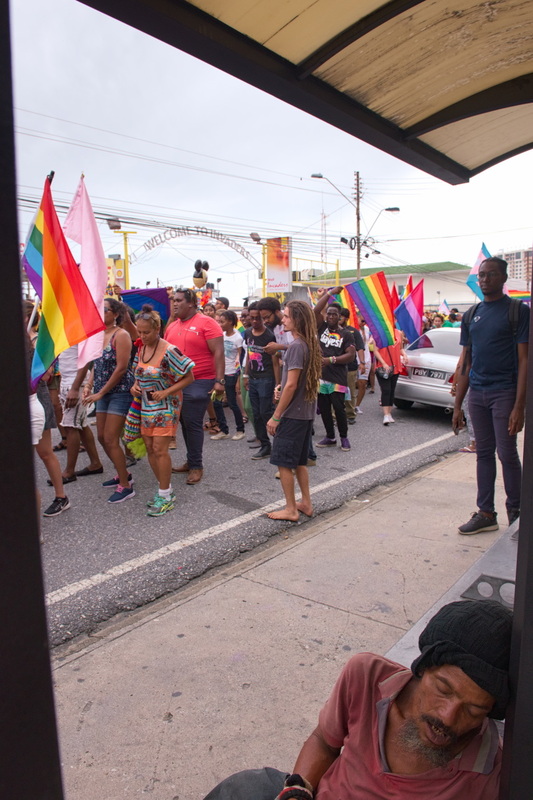 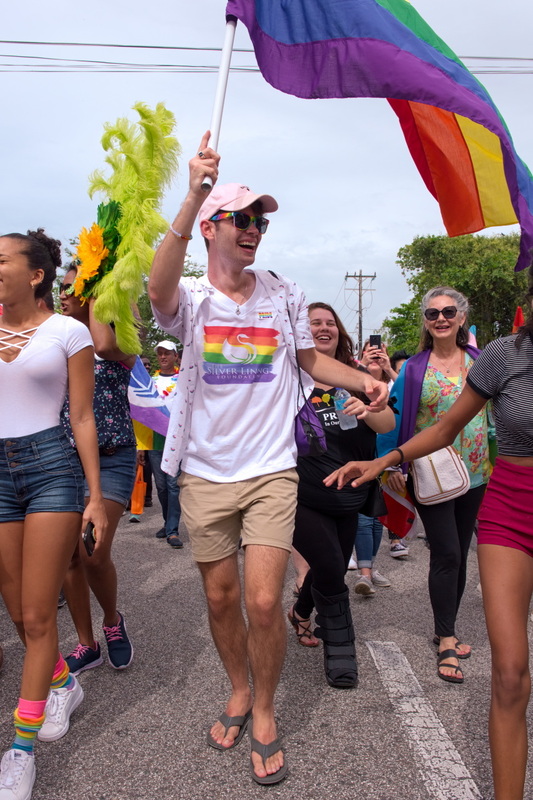 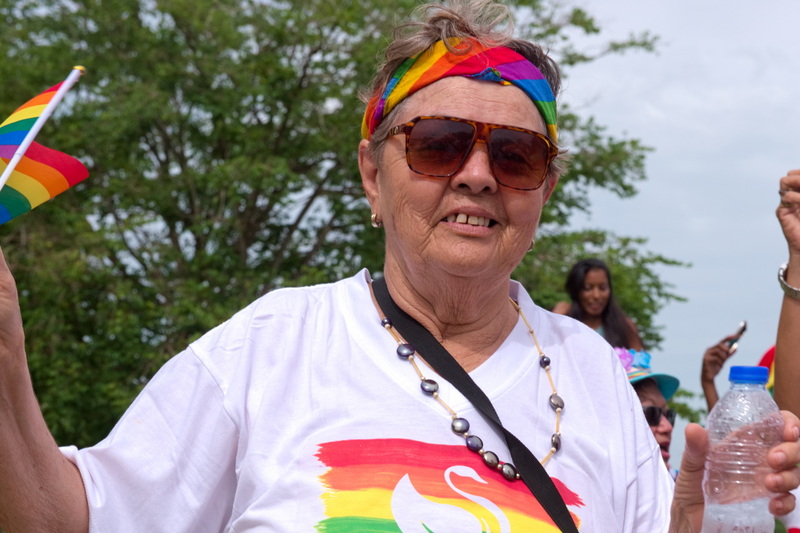 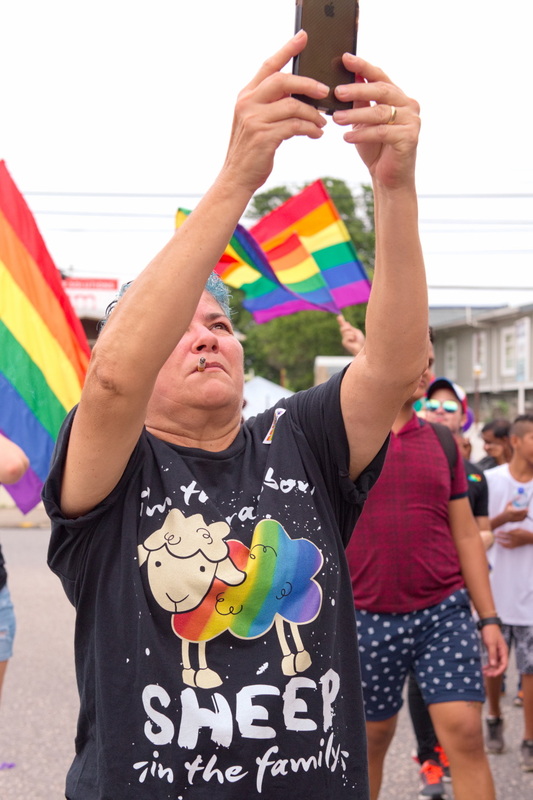 The atmosphere remains light and jovial as the Pride Parade gets to its destination after around ninety minutes on the streets. 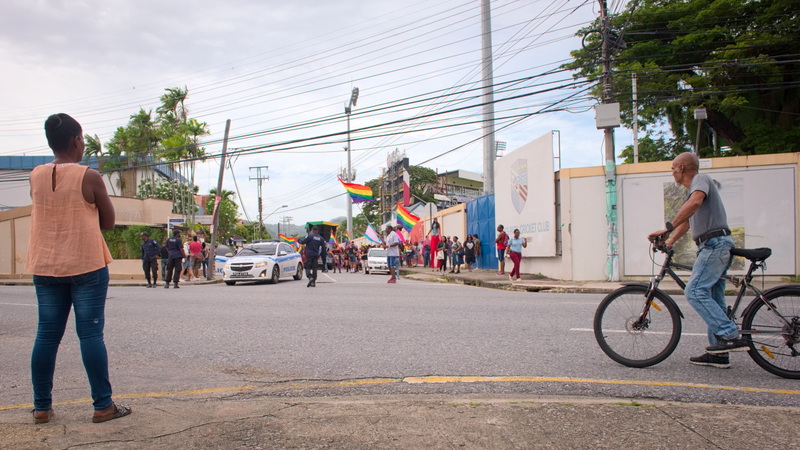 Applause is given to the TT Police Service and the TT Red Cross Society’s ambulance service for their support.